Popcorn ceilings may have been popular decades ago and still appear in some new construction homes, but the popularity of the texture has decreased. Adding additional plaster to the popcorn ceiling may disguise some of the plaster's look, but will not always look professional. You have a few different options to change the look of a popcorn ceiling. It is important to understand the project may take several days and may require long periods of work. Additional plaster may be added to your plaster ceiling by hand or sprayed on. However, it is important to test the technique first. If you are not happy with the results, it will be more difficult to remove two layers of plaster instead of just one. 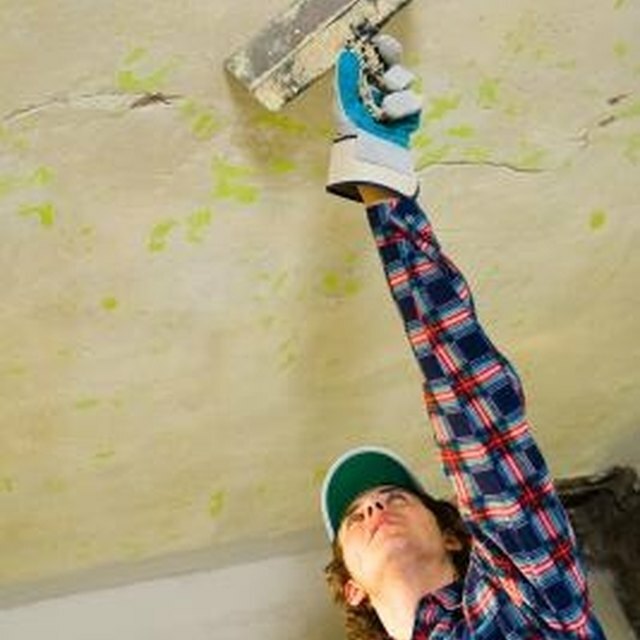 Purchase a can of popcorn spray texture used to fix patches in popcorn ceilings. Spray a large piece of cardboard with the plaster and then add your second layer of plaster by hand. Trowel on the plaster using a drywall trowel and joint compound. Wait a day or two to ensure you like the look of the newly plastered sample piece before plastering your ceiling. Adding a second coat of plaster is not often done to popcorn ceilings. The second coat of plaster may be too heavy for the ceiling. It is actually attaching itself and binding to the popcorn texture and not the drywall. You will be relying on the binding of the original popcorn ceiling to continue to bind to the drywall underneath. Instead, opt to remove the popcorn ceiling. Wet the ceiling with water and a few drops of dish soap. Spray the water onto the ceiling and allow to set for about 10 to 20 minutes. Begin to scrape using a plastic putty knife. Try to not gauge or dig into the drywall when removing the popcorn texture. Popcorn ceilings should not be sanded, especially if the home was built in the early 80s or before. Some building materials used during this period, including popcorn ceiling, contained asbestos. Though the carcinogenic substance is not exposed when the popcorn ceiling is firmly in place, it is when you sand it. Sanding will remove some of the texture, but only do so after an asbestos company has tested your ceiling. When sanding, always wear a drywall dust mask and protective eyewear. Use a medium grit sanding block or sanding pole. Once finished, the ceiling may be replastered or simply painted. Instead of removing the popcorn ceiling, change the look of the room by adding a different coat of paint. Paint the popcorn ceiling with flat paint. Any other paint will attract your eye to the ceiling due to the sheen level. Stark white ceilings may be very noticeable when walls are painted, but a ceiling with a neutral coat of beige or taupe may blend in less conspicuously, and you may not even notice the popcorn texture.